How September flew! I ended my job at the hospital on September 9th, and started my job at the credit union on September 12th. So my whole routine has been turned upside down, but I think it's going to be a good thing once the dust settles. Unfortunately, all that upheaval caused a lack of reading on my part for September. The Death of Bees by Lisa O'Donnell was unique. It had three narrators and revolves around two sisters growing up in the slums of Scotland. Their loser parents wind up dead, and the girls decide not to tell anyone because they'd rather continue fending for themselves than be put in foster care. Their elderly neighbor knows something is up, but can't quite put his finger on it. He's determined to help the girls out anyways. There's a wide assortment of wrenches in their plan, including a drug dealer their dad owed money to, an over zealous grandfather who shows up, and a truancy officer. Goodreads describe it as "coming of age" and I suppose it is. And it was good, but there was just something missing for me. I can't quite put my finger on it. Silas Marner by George Eliot was my only other read for the month. This book took me way longer than it should have, but by the time I finished it, I wasn't really sure what all the hoopla was about. It's a classic, but it doesn't really have anything exciting, or suspenseful happen. Silas Marner goes from being a miser to a nice fatherly type figure who cares for Eppie's happiness above his own, but I felt like this could have been knocked down to a short story no problem. Blasphemous I suppose, but I think it's by far the most disappointing classic I have read to date. and A Tale for the Time Being by Ruth Ozeki were all part of my Books n Bloggers Swap with Jenni King. You can read more about it here. Stone Mattress by Margaret Atwood was found on a trip to Goodwill. It's a collection of her short stories, so I'm looking forward to giving it a read. Children of God by Mary Doria Russell, which is the sequel to The Sparrow- my favorite read of 2016! So that brings my year to date totals up to 30 books read, 46 books acquired. I'm really going to have to have a good fourth quarter to get my goal of 48 books read accomplished, but I do think it's still possible! How bout you? 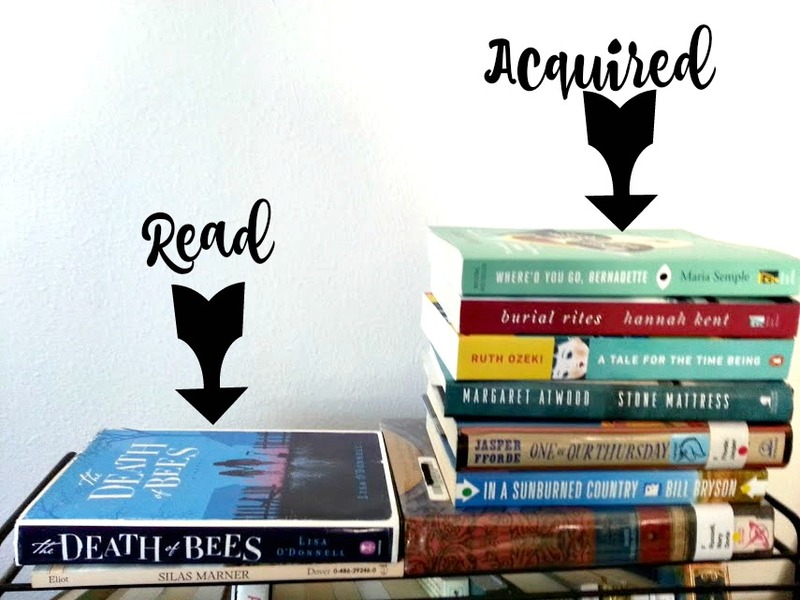 Are you on track with your yearly reading goals?